Androcymbium longipes (Colchicaceae) Now called Colchicum longipes. It arises from a slightly flattened tuber with a black fibrous covering. 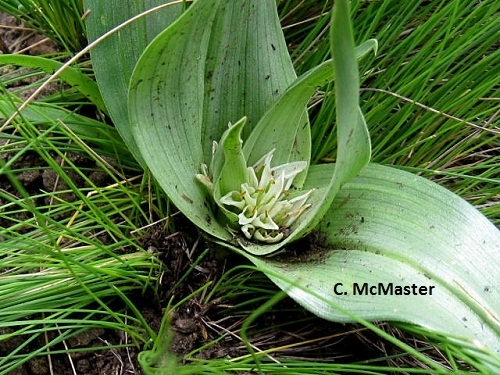 It usually has at least four leaves, the outer two straggling along the ground and the inner leaves standing erect. The plant is dormant in summer. About six flowers with pointed, hooded petals and purplish styles, crowded at the base of the leaves. Sowing: Sow seeds in autumn in a well-draining medium. Spread seeds thinly to prevent damping-off. Cover with a thin layer of river sand. Keep moist. Seed will germinate in about 2 weeks after sowing. Locality: Tiffindell. Harvest: April 2019.